Construction of the new battle cab, part of the modernization and expansion of the Cheyenne Mountain Operations Center, is scheduled to be complete this month. Mountain facility employs a new look for protection from foreign and domestic threats. The CheyenneMountainOperationsCenter, originally designed to coordinate the defense of North American countries and their allies against the looming communist threat, has expanded its focus and facilities to address the threats emerging in the post-September 11, 2001, world. The transformation was the result of a comprehensive two-year modernization of its command center, completed this year. Cheyenne Mountain Air Force Station overlooks the city of Colorado Springs, Colorado, and is primarily encased in the front range of the Rocky Mountains. It is hidden within the North American Aerospace Defense Command–Northern Command (N-NC) Cheyenne Mountain Operations Center (CMOC). The center, which manages missile correlation, space control and tracking, and air threat tracking, had undergone two previous construction projects and several upgrades of mission and communications systems. But after September 11, the N-NC determined that the current threats, both domestic and foreign, mandated that the 1960s-era CMOCCommandCenter be completely rebuilt and refurbished. The remodeling took a 1,870-square-foot command center, battle cab area and galley and increased the space to 2,750 square feet, adding a breakout conference room, combatant commander suite and office areas. The 721 Mission Support Group (MSG) handled this task with the help of Lockheed Martin, which was awarded the $3.1 million contract in September 2003. To prepare for the project, the communications squadron’s integration and planning branch established a team of government and contractor personnel who managed the movement of 45 mission and office areas over an 18-month period. Mission centers included establishing an alternate operating location to act as the interim command center and battle cab with new consoles, mission system connectivity, communications and videoconferencing capabilities; reorganizing the Combined Intelligence Warning Center mission and communications; upgrading power, communications and consoles for the Air Warning Center; establishing a new operating location for the Contingency Operation Center; rebuilding the Space Analysis Center mission area, including a new secure classified room; relocating the N-NC operation and strategic planning groups; and constructing a new Missile Correlation Center (MCC) with new consoles, mission system connectivity and communications capabilities. While undergoing the remodeling and upgrades, CMOC, 1st Space Control Squadron and 721 MSG offices were relocated several times with minimal impact on day-to-day operations. These moves included the expansion and addition of network capabilities in the Technical Support Facility (TSF) located outside the mountain. Critical to the CMOC and 721 MSG personnel was the establishment of the first protected distribution system in the TSF for handling classified information via the secret Internet protocol router network. While this activity was underway, the Ground-based Mid-Course Defense (GMD) system was integrated into the interim command center and the new MCC. The 721 MSG handled the remodeling, and the 721 Communications Squadron (721 CS) performed the communications work. The 721 CS installed ClearCube blade computer systems in the new CMOCCommandCenter to increase efficiency and to support the space and availability requirements. Blade computer systems place all computer components onto a removal blade, which is rack-mounted in a secured communications room. A control module, which is approximately the size of a VHS tape and called a C-Port, is located at the operator’s position and accesses the blade computer. The C-Port provides a more efficient and streamlined workspace by removing the noise, bulk and heat of standard desktop computers. The use of blade computers in the command center offers several benefits over traditional desktop computers. The 721 CS was able to increase system access, reduce mission impact maintenance and provide a more efficient work environment to support effect from operations. Blade computers have a centralized control and maintenance capability. If a blade malfunctions, an administrator can remotely transfer the operator to another blade while repairs are made, increasing system availability. Computer maintenance and repair is done in the communications room without disrupting mission operations. Blade computers also provide a more secure environment by controlling access to the computer and media storage. An operator can access media storage only on specified computers, reducing the threat of loss or unauthorized access. For the operator, the greatest benefit of blade computers is the reduction of network equipment at the desktop. Operators can access several networks at a fraction of the space occupied by one standard desktop computer. The overhaul of the Cheyenne Mountain Operations Center combines new technology and rebuilt facilities to provide essential support for the modern warfighter. CMOC mission requirement changes resulting from September 11 and the introduction of GMD included the addition of console positions within the command center and large screen displays. The new center was expanded to support these requirements as well as to provide for surge capability for key positions. Three quads of Clarity Lion large screen displays were installed on the front wall, and two sets of Clarity Puma quads were installed on each sidewall. This allowed users to view multiple displays on a quad, or to expand individual large screen displays to a full quad view with the touch of a button. To provide easy maintenance and to minimize interruption of mission operations, the majority of the video hardware was relocated to the communications room and the maintenance catwalk around the command center. Another feature added to the center was the Integrated Secure Telephone 2 (IST-2), which replaced all OPS Loop (central conference for CMOC missions) telephones in the center. This is the first implementation of the 50-button secure/unsecure capability in the CheyenneMountain complex. The 721 CS also was responsible for obtaining and validating N-NC requirements for the new battle cab. The group has worked with N-NC personnel to design, install, integrate and test the communication and video architecture and the new battle cab, which is scheduled for completion this month. The N-NC facility will integrate collateral and Joint Worldwide Intelligence Communications System, or JWICS, data and video into a single architecture capable of displaying information from any battle cab position onto a large knowledge wall for situational awareness. The battle cab includes a custom-made, glass-top main table with imbedded network, secure and nonsecure communications capabilities for 13 personnel. Two tables will be included for two executive officers and common operational picture and information exchange broker personnel. There will be 11 network-capable positions located around the exterior walls for other support personnel. The N-NC also is providing a separate JWICS display and videoconferencing capability. 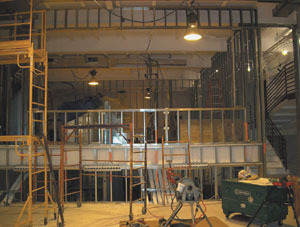 These integrated systems will be controlled from the audiovisual room. The control of battle cab capabilities also includes a snap glass technology that visually isolates the battle cab from the command center with the push of a button on the Crestron touch pad. A breakout conference room is readily accessible to the battle cab for high-level discussions. It is equipped to handle nine people around the main conference table with one position for an executive officer or aide. Each position will be cabled for access to all data networks, with JWICS, secure and nonsecure telephone, and video teleconferencing capabilities. A Christie Digital Systems knowledge wall will display video from any position within the breakout conference room as well as video from the integrated video switching system. In addition to the battle cab and breakout conference room, the new combatant commander suite will enable access to data networks and secure voice communications and videoconferencing for senior U.S. Defense Department personnel. The room will be outfitted with an executive desk, Murphy bed and flat panel wall display integrated into the video switching system. A restroom with shower will accommodate personnel for extended stays during crisis situations. The 721 CS team designed and implemented two key systems to support the command center project. The first is an internal public address (PA) system for emergency announcements throughout the center, battle cab, breakout conference room, combat commander suite, galley, restrooms and administrative areas. The PA system is integrated into the video switching system to broadcast source audio or to use during tours for high-level officials hosted by CMOC senior leadership. The second system is the fiber trunk infrastructure. This robust infrastructure is composed of single- and multimode fiber trunks interconnecting the command center, NetworkControlCenter, SystemCenter, Technical Control Facility and MCC. The infrastructure provides immediate and diverse access for network switch uplinks, mission systems and client hardware. The effort required the support and expertise of virtually every facet of the Mountain Communications team—active duty, civilian and contractor. The installation portion was led by 721 CS plans and programs personnel—both active duty and civilian—working closely with the contractor engineering team. The engineering team made sure the correct equipment had been ordered for the various work centers responsible for technical installations. It also ensured that start/finish installation windows were carefully pre-coordinated and that timelines were met. Personnel from a telephone work center—known as the Red Switch—ensured that all secure telephone capabilities were installed via new cable runs and installed the telephones themselves. Computer maintenance ensured the user interface electronic workstations were properly installed and tested. Video technicians were trained on the command center’s new video equipment and now support both legacy and new video displays throughout CheyenneMountain. The NetworkControlCenter installed ClearCube images and created all necessary user accounts. Finally, all installations underwent a quality control inspection by the Mountain Communications team to ensure that industry safety and technical specifications were met. The 721 CS team has been involved from the initial definition of requirements for the new CMOCCommandCenter and will maintain its level of support for as long as the facility exists. Before the facility opened, the 721 CS had installed 11,220 feet of jumpers for cross connects, 75,000 feet of Red Switch lines, 9,000 feet of telephone Category 5 and 247 miles of fiber. The operations portion of the project culminated in March 2003 with a ribbon-cutting ceremony, but warfighters already had been working in the new facility for more than a month. Testing and final checks began three months prior to the start of operations and involved every flight of the 721 CS. The rest of the project will be complete this month, but the Mountain Communications team’s active duty and contractor personnel will continue to perform round-the-clock mission support and maintenance. Capt. James Coughlin, USAF, is commander, Information Systems Flight, 721 Communications Squadron.